The following pages contain nothing new and nothing original, but they do contain a good deal of information gathered from various sources, and brought together under one cover. 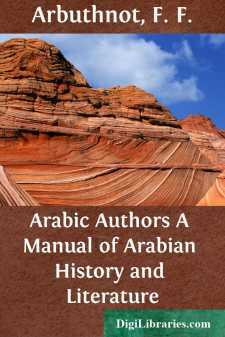 The book itself may be useful, not, perhaps, to the Professor or to the Orientalist, but to the general reader, and to the student commencing the study of Arabic. To the latter it will give some idea of the vast field of Arabian literature that lies before him, and prepare him, perhaps, for working out a really interesting work upon the subject. Such still remains to be written in the English language, and it is to be hoped that it will be done some day thoroughly and well. It is gratifying to think that the study of Oriental languages and literature is progressing in Europe generally, if not in England particularly. The last Oriental Congress, held at Stockholm and Christiania the beginning of September, 1889, brought together a goodly number of Oriental scholars. There were twenty-eight nationalities represented altogether, and the many papers prepared and read, or taken as read preparatory to their being printed, showed that matters connected with Oriental studies in all their branches excite considerable interest. England, too, has been lately making some efforts which will be, it is sincerely hoped, crowned with success. The lectures on modern Oriental languages lately established by the Imperial Institute of the United Kingdom, the Colonies, and India, in union with University College and King's College, London, is full of promise of bringing forth good fruit hereafter. So much is to be learnt from Oriental literature in various ways that it is to be hoped the day may yet come when the study of one or more Oriental languages will be taken up as a pastime to fill the leisure hours of a future generation thirsting after knowledge. -cially An-Nadim's 'Fihrist,' a most valuable book of reference, ought to be done into English without further delay. Private individuals can hardly undertake the business, but a well-organized and permanent Oriental Translation Fund, assisted by the English and Indian Governments, could and would render extraordinary services in the publication of texts, translations, and indexes of Oriental literature generally.